With the revelation that sugary diets are a contributing factor to a huge rise in tooth decay for kids, isn’t it about time media coverage of dentistry was given a touch of the ‘feelgood factor’? Let’s face it, the latest news story – that reveals hospitals in England are seeing thousands of very young children needing their baby teeth extracted – is alarming. The fact that dental disease is almost always preventable makes it doubly worrying. So, what can we do to turn the tide on these statistics? Dental experts link rotting kids’ teeth to high sugar diets – and, with a rise of 24% in the number of children’s teeth being pulled, parents have the power to prevent. Alarmingly, even though NHS dental treatment is free for anyone under the age of 18, a whopping 42% failed to get to the dentist in 2015-16. A global study this week also suggests that although the vast majority of us know the importance of brushing teeth for two minutes twice a day and regularly visiting the dentist and so on, many of us fail to put it into practice. Claire Stevens is a consultant in paediatric dentistry and spokesperson for the British Society of Paediatric Dentistry (BSPD) and is keen for us all to make a difference. She’s even appeared on the BBC’s The One Show, where she showed Jonathan Ross how to brush his teeth. She says said that one of the most worrying myths that continue to be shared is that baby teeth don’t matter. She explains: ‘Your child’s baby teeth – also known as milk teeth – DO matter and have an important role to play. They hold the space for second teeth to come through into but, because the enamel is thin, they are highly susceptible. Pester power plays a big role in the downfall of children’s diets and many parents confess to giving in to their kids’ demands for unhealthy snacks for the sake of an ‘easy life’. 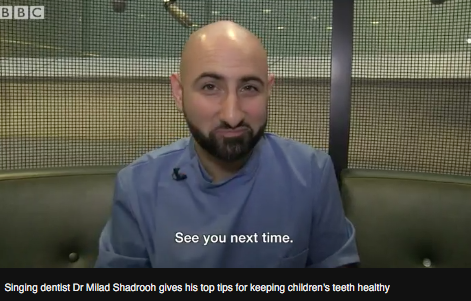 ‘Singing Dentist’ Milad Shadrooh – our oral health expert here at comparethetreatment – is keen to help parents ensure their children’s smiles are protected. He has already gone a long way to changing how we view dentistry, with his fun video clips and dental-related parodies of hit tunes, and is leading a campaign to make the face of a dentist a friendlier one to the younger generation. 2. Get your children to the dentist as early as possible – even when mums are pregnant, it’s relevant. This gives the dentist an opportunity to offer advice. Bring along babies, too – the earlier children can get used to the sights, smells and sounds of the dental clinic, the better! 3. Keep an eye on the children’s diets. Sugar damages teeth – and frequency of intake makes it worse. So, reduce how often they have sugar and be aware of those dreaded hidden sugars as well. Juicy and dried fruit are secret villains! 4. Finally, visit the dentist regularly! Many dental clinics make a point of being child friendly. Some hold children’s days so that the clinic is an adult-free zone, while others have a children’s corner where there are toys and books with key oral health messages. There are also some cool education tools at the Oral Health Foundation’s online shop demonstrating that dentistry doesn’t have to be a dull topic when trying to get kids to clean their teeth and visit the dentist.